Site Launch: www.cheeseconference.org - Amplitude Design, Inc.
Amplitude Design, Inc. is happy to announce the completion of www.CheeseConference.org. This is the last in a series of five site developed for the Wisconsin Cheese Makers Association. WCMA is a Madison base association representing the cheese industry on a global level. 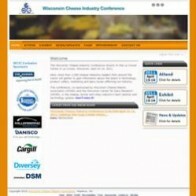 The Wisconsin Cheese Industry Conference uses Authorize.net’s AIM integration for e-commerce credit card processing. Amplitude Design, Inc. developed the application to complete online enrollment for both attending and exhibiting at the conference. If you would like to speak with us about streamlining your processes, please contact us?